Women's beautiful petite 3 piece AAA grade cubic zirconia wedding set. Crafted from Solid 925 Sterling Silver/ 925 stamp,nickel free.The ring features an engagement ring with a 6*6mm round cut center stone surrounded by 45pcs smaller round stones and two 2*2mm blue cz down the sides. 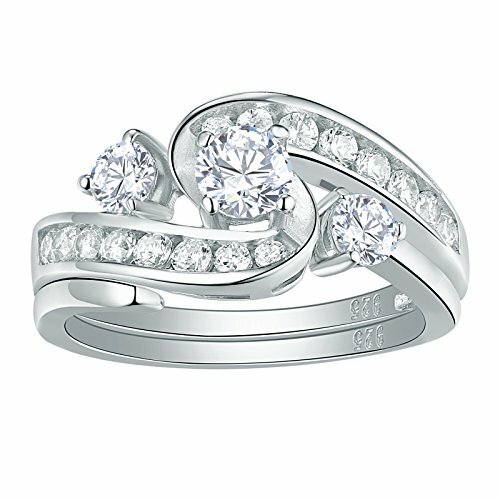 The matching band features 40pcs matching round stones in a pave setting. Top quality stones display amazing enriched clarity just like real diamond! Main Stone Size:4*4mm,0.8ct,Round Brilliant Shape.